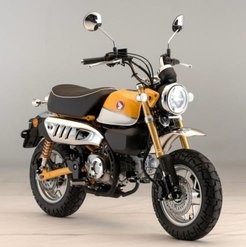 The all new Honda Monkey bike has now arrived in the showroom. Honda's iconic Monkey bike from the 70s has been brought back to life with a modern twist. The styling draws heavily on the original, but is complemented by modern, premium touches such as USD forks, twin rear shocks, LCD instruments, IMU-based ABS and full LED lighting.